As Charles Schulz of Charlie Brown fame once said, “Happiness is a warm puppy.” That statement comes to life in the halls of Boston Medical Center where 11 dogs—ranging from a Boston Terrier to a Labradoodle—roam as part of the Healing Pups Program to bring comfort and joy to BMC patients. The Cravens have strong ties to Boston Medical Center. Their eldest son JP, was severely injured during the Boston Marathon bombings in 2013, and as a result, received emergent care at BMC. Since then, the Cravens have made it their personal mission to give back to BMC any way they can. Joe Craven, Nancy’s husband, dog-father to Stanley and member of BMC’s Philanthropic Trust, is running the Boston Marathon for the fourth year in a row as part of Team BMC—the hospital’s official marathon team. Joe and his fellow running teammates form JP’s Team, which also included his children, JP and Deirdre, when they ran with Team BMC in 2014. This unique therapy program was first established in 2012 by BMC’s Office of Patient Advocacy, which strives to provide systems for coordinating, investigating and resolving patient and family grievances. The pooches visit the hospital campus regularly, offering in-hospital comfort to patients and families going through trauma and illness. They also lovingly deliver a furry, warm respite from the stresses of the day to all members of the BMC staff, who are always ready to give their four-legged colleagues a pat on the back, or a heartfelt hug. Stanley joined the program in December 2015, where he became the tenth member. 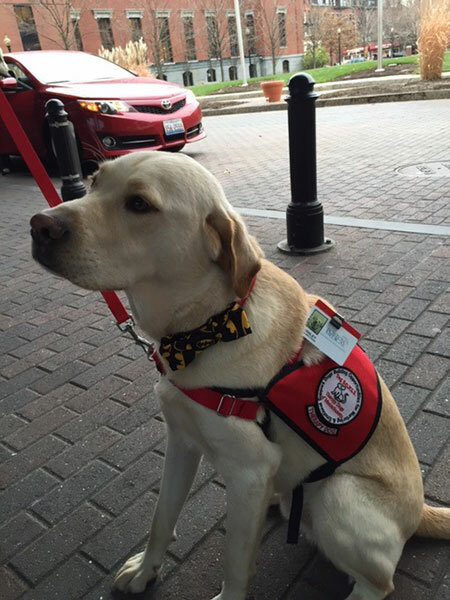 Dogs of the program must undergo a thorough training and evaluation to become certified therapy dogs, so Nancy and Stanley spent much of the summer attending classes to get Stanley ready for his winter debut.